"[W]hen I began this article I was dead set against homeschooling, as are many certified teachers. But, after doing research, I’m not so sure." It's not the most ringing of endorsements, but it represents a big step, and Susan Schaefer's Homeschooling Goes Mainstream and Here's Why is postive about homeschooling from beginning to end. I learned that homeschooling is way more organized than I thought and very in vogue at the moment. In 1980, home schooling was illegal in 30 states. Now, it is legal in all 50 states with about 1.5-2 million children being homeschooled in the U.S., roughly 3 percent of school-age children nationwide. This reminder of how far we've come gives me hope for the cantons of Switzerland where homeschooling is still illegal. I pray they'll make progress a bit faster than we did, however—Joseph gets nearer to compulsory school age with every passing hour. [T]he stigma associated with homeschooling is gone as it becomes more and more mainstream. I thought the stigma was ancient history, although maybe that's because I rarely pay much attention to such things. Our kids would know better. The image of homeschooled children spending their days sitting at the kitchen table are long gone. Today’s homeschooled are out and about with many museums offering programs to homeschoolers as well as other hands-on activities, such as nature centers. 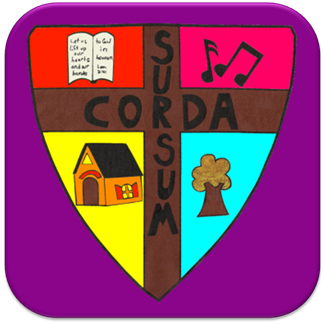 There are endless websites dedicated to non-traditional learning opportunities in addition to websites offering support and resources for homeschooling families. Hmmm. Our kitchen table was dedicated to eating, not schooling, though I can't deny that a lot of education happened during dinner. We certainly did our share of out-and-about! All those "endless websites" would have been nice, though. Hard as it is to believe, children, this was Before The Internet, though we did have the Education Round Table on GEnie. According to the Homeschool Progress Report 2009: Academic Achievement and Demographics, homeschoolers, on average, scored 37 percentile points above their public school counterparts on standardized achievement tests. Nothing new here, but it is nice to know that the advantage still holds as the homeschooling numbers have grown from "the few, the proud." [H]omeschooled kids are far from isolated from peers, do well in social situations, and are more likely to be involved in their community. The education level of the parents had little effect on the success of their children, as did state regulations, gender of the student, or how much parents spent on education. Again, nothing new. In fact, there is little new in the article, but it was still encouraging to read. If there's one thing I've learned in my more-than-half-century of life, it's that what's well known needs to be said again and again to each new generation, each new situation, each new demographic, or it is in danger of being lost. What caught my eye about this article, above and beyond the homeschooling connection, was the paper in which it appeared: The Middletown (Connecticut) Patch. I thought the format and logo looked familiar, and indeed it was the obviously-related East Haddam-Killingworth Patch of a year ago April that mentioned my research on Phoebe's Quilt. So it must be an important journal, right? It's not the New York Times, or even the Hartfort Courant, but I'll thank the East Haddam-Haddam Patch for their article on the quilt show, and their mention of Phoebe's Quilt. (H/T PJS) As is true with most newspaper articles I've known the truth about, this one manages to tell gist of the story accurately while erring in the details. One of the most interesting ... had to be Prudence Sloane’s quilt. “I inherited a trunk from my mother, this was in the bottom of it,” Sloane said. The quilt contained the names of family ancestors stitched into it. 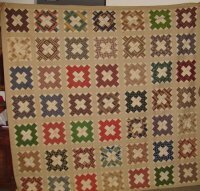 It turned out the quilt belonged to Phoebe (Burr) Scovil, Sloane’s first cousin four times removed. It was most likely a wedding present from friends and family around 1849. Sewn into each square section of the quilt was a different person’s name. Sloane’s sister-in-law, Linda Wightman, who was very interested in the family’s genealogy, did research on all the names of the people on the quilt. 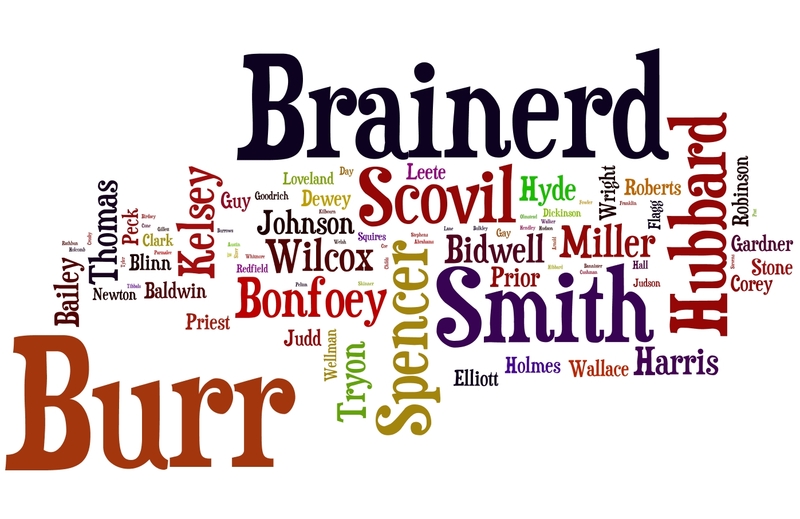 Wightman even went to Boston to investigate the names in a genealogy library. Wightman made a booklet and gave it to Sloane as a Christmas present with information on Phoebe and how each person sewn into the quilt was related to her. The quilt actually belonged to Phoebe L. (Scovil) Bonfoey, who is, indeed, Prudence's first cousin four times removed (and my fourth cousin four times removed, for that matter). Phoebe (Burr) Scovil was her mother. The creation of the quilt was most likely around 1849, the year one of the signers died and one, who signed with her married name, got married. Phoebe herself married Horace A. Bonfoey in 1852. To say that I "even went to Boston to investigate the names in a genealogy library" sounds rather pathetic unless you realize that I, unlike the quilt, don't live in Connecticut. In any case it's not something to be impressed about; whenever I make the (all too rare) visit to Boston, New York, Hartford, or other research hot spot, it's for a lot more than just the quilt. Most of my research for this project was done using the amazing resources available online. That's not to say I couldn't have walked to Boston in the time it took me to gather the information—not true, but at times it felt like it. And, hey—they spelled my name right! I'm sure I have Prudence to thank for that. Too many short nights. 'Way too many long days. I'm currently babysitting the printer as it struggles with the second edition of Phoebe's Quilt, which I plan to take to Office Max tomorrow later today to have covered and bound. Then I'll pack it off to my sister-in-law so she'll have a few copies when she shows the real thing at the Haddam Neck Congregational Church's Annual Quilt Show this coming Saturday. Hopefully that will generate interest among local folks who might be able to shed light on Haddam 160 years ago and the families I've come to know through this Friendship Quilt. The printer is silent. Four copies printed. I won't bore you with why it took so long to get four measly copies done, but it almost makes Office Max's charge of 50 cents per (color) copy look reasonable. Almost. Anyway, they're done. Tomorrow I'll change out the exhausted black ink cartridge and hope the (already replaced once) color lasts through one more printing. Then bind ... ship ... and I'll be FREE! Um, not exactly. There's still some work to do on the pdf version, and of course more research I want to do—eventually. But I'm looking forward to scaling back, a lot, and tackling all the stuff that's been ignored for the last several weeks, including the very lovely Florida spring days that will soon pass into not-so-lovely summer. Anyway, that's why you haven't heard much from me lately. How did you celebrate St. Patrick's Day? We braved the crowds and streets awash in green beer to see Freud's Last Session at our favorite Mad Cow Theatre. Once again I must be grateful to my husband who drags me to such things when I'd rather stay at home because my revision of Phoebe's Quilt is bumping up against its April deadline with an unthinkable* amount of work still remaining. There are perhaps a thousand wrong ways to craft a play about a hypothetical meeting between Sigmund Freud and C. S. Lewis, but playwright Mark St. Germain achieved the impossible: a show that is intellectually honest, fair, and respectful of both the character and the viewpoints of each man. Similar respect, fairness, and honesty shone through the performances of Steven Lane (Lewis) and Terry Wells (Freud) under the direction of Mad Cow's Rick Stanley. As it turns out, St. Germain's inspiration was Harvard professor Dr. Armand Nicholi's The Question of God, so if I'd only remembered my own blog post from six years ago, I wouldn't have been so surprised at the excellence. After the performance we had a chance to ask questions of the director and the actors, and if there was one overwhelming impression I took home from the audience's response was their appreciation, tinged with astonishment, of an example of two people with strong, heartfelt, and opposing ideas engaging in discourse that is both substantive and respectful. In truth, I was a bit shaken to realize that ordinary civility has become a thing at which to marvel. You can see excerpts from the play at the official New York site. I have to say that I liked the work of Lane and Wells better, though it's not fair to judge based on small clips. *I know, I know. What that means is that I must think about it and follow Andy Flowers' dictum: Good enough is better than perfect. Genealogical research is as bad as computing when it comes to sucking up every available minute and more. And when the genealogical research is being done on the computer—because I really can't afford to fly up to Boston or New York between now and April to delve in my favorite libraries—well, you get the picture. Joy is three days old, and all is well. She seems to have a regular fussy period between midnight and three, but other than that has been treating her parents well. She sleeps well, despite the frequent checking, patting, and noisy chaos that comes with having three loving, young siblings. She eats well, drinking in great, noisy gulps. Mom is handling the engorgment stage as well as can be expected without having a nursing toddler to help out. Grandma is happy to be done with meconium diapers. UPDATE: The Second Edition of Phoebe's Quilt, corrected and expanded, is now available. My sister-in-law found it in a trunk: an old, handmade quilt. Each block was inscribed with a name, often a city, and sometimes a Bible verse. The cities and many of the surnames were familiar, but no name was identifiable as that of someone in the family. Who were these people? Whose quilt was it, and when was it made? And how did it end up in Prudence's trunk? 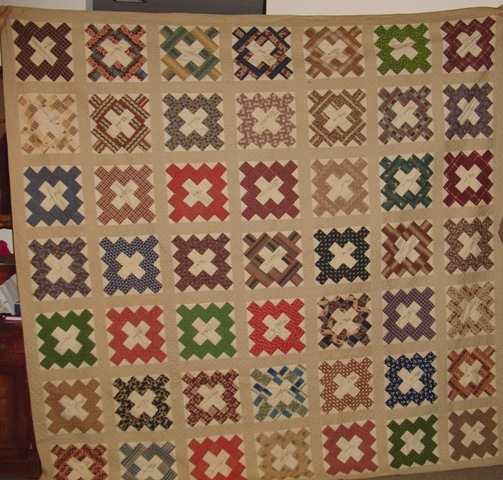 Far be it from me to resist a genealogical puzzle, especially when it can be turned into a Christmas present: I would use my genealogical resources to decipher the quilt, and turn my research into a book to put under the tree. Little did I know how much of my life this little project would consume; I'm certain the quilt itself was completed in less time.